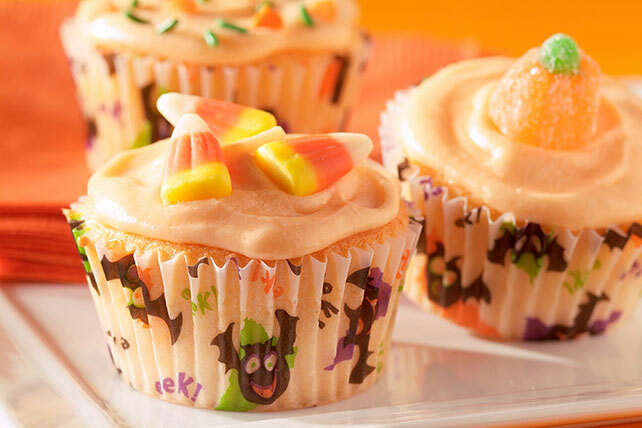 Give kids & adults a treat with this Halloween Cupcakes Recipe. All you need is white cake mix & KOOL-AID to make our Halloween Cupcakes Recipe. Frost cooled cupcakes with Colorful Frosting made with orange flavor drink mix. Decorate with sprinkles or candies or sprinkle with additional drink mix, if desired. At 24 servings, this fun recipe is great for a Halloween party or classroom celebration. Substitute 1 pkg. (2-layer size) white cake mix with pudding in the mix for white cake mix. When hosting a children's party, make sure that you have the telephone number for each child's parent just in case of a mishap or emergency.